This was one of the first photoshoots we organised in 2018 and you can instantly see why we have selected this as one of our highlights. This luxurious roof terrace has some astonishing scenic views that overlook the Battersea area which include the iconic power station, you can now understand why it was important for the clients to create an exquisite dedicated outdoor living space. 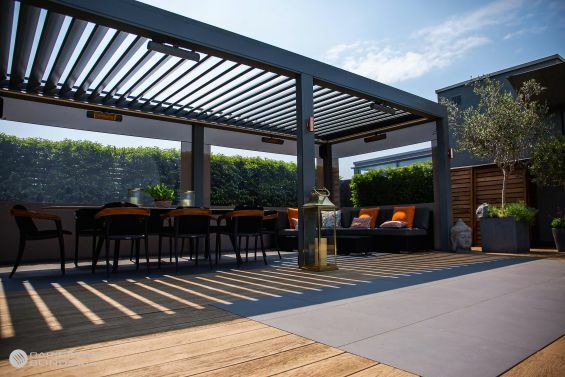 By making our Deluxe Outdoor Living Pod™ the main feature of this lavish roof top garden we have enabled the clients to use this space all year round, its watertight louvered roof system allows them to take control against all the elements with weatherproof side screens to aid. The bespoke elements are what makes this project special, its integrated light fixtures, speakers and special hardware colour make this louvered pergola stand out. The client’s finishing touches with the Asian influence styling complete the look making it their own. Stretching 7m across the clients now have a chill area and a nice alfresco space to enjoy, just imagine having a dinner party with your friends whilst enjoying the annual fireworks under the comfort of this bespoke outdoor garden pod. View more images of this photoshoot here. 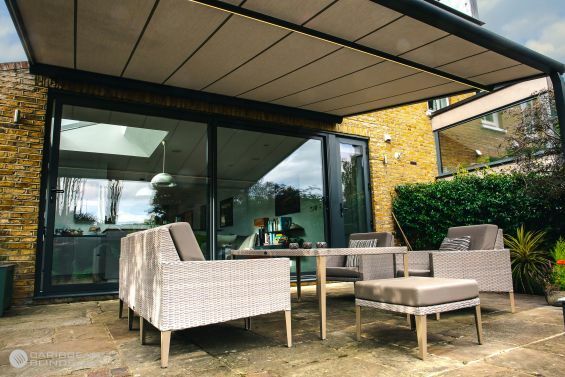 The great thing about garden awnings is that they have a dual purpose, one being they can keep your glazing shaded from the suns intense heat and cool the internal temperature and the bonus being it then creates a dedicated outdoor living space to use. 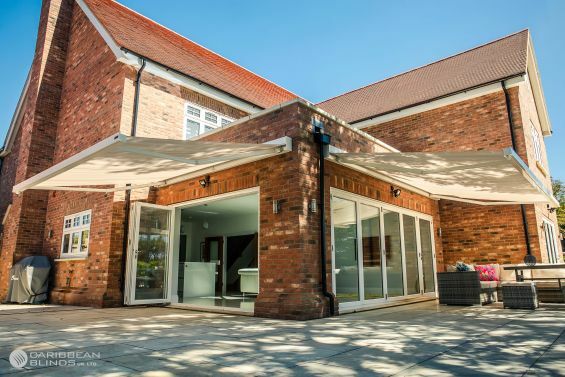 What makes this particular project distinct is these two awnings have been situated over the bi-folding doors to naturally extend the internal space to the external. When the doors are fully open it instantly creates a fluid connection with the outdoors creating a harmonised space that the family can enjoy. By unifying the spaces it creates a new dimension for the home and garden. The Puerto Rico Pergola Awning has functionalities that go beyond a normal awning, which is covering a larger surface area to provide a comfortable outdoor living space. The pergola awning still provides the same benefits as an awning with solar protection for the glazed areas but overall the main purpose of the pergola sun shade is its outdoor living properties. What stood out for us on this project is the design element, as you can see we have matched the pergola canopy hardware colour with the existing anthracite sliding door, this colour always works astoundingly against London Brick, enhancing that contemporary feel. The fabric selection accents the beige patio furniture and brick work making this outdoor living area satisfying to look at. 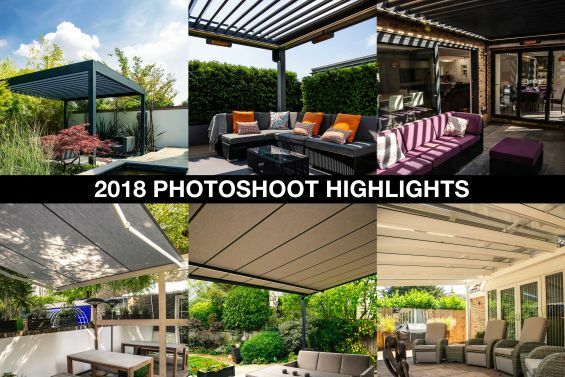 We hope you have liked our highlight selection of 2018. If you have been inspired by our featured products then feel free to contact us to find out more as we would be happy to help you create a design that works for your garden landscape – 0344 800 1947 or alternatively you can use our quick enquiry form to receive our free detailed brochure.